BobFest 2017 is February 3rd – 10th in Atlanta. Friday, February 3 is an evening with the international poet, actor, broadcaster and social commentator, Mutabaruka. This will take place at the Southwest Community Arts Center located at 915 New Hope Rd. in Southwest Atlanta. The event will be hosted by legendary poet Sunni Patterson and will feature musicians Bilal Sunni Ali on saxophone and Baba Sola on percussions. There will also be a marketplace with food and healers garden featuring music by DJ Kemit. Doors open at 6 pm with showtime at 6:30 pm. The venue for our evening with the legendary Mutabaruka has limited seats so purchasing advance tickets is suggested. Call 404-590-8010 for more information. Saturday, February 4 is the Annual Trenchtown Rock international night dance. 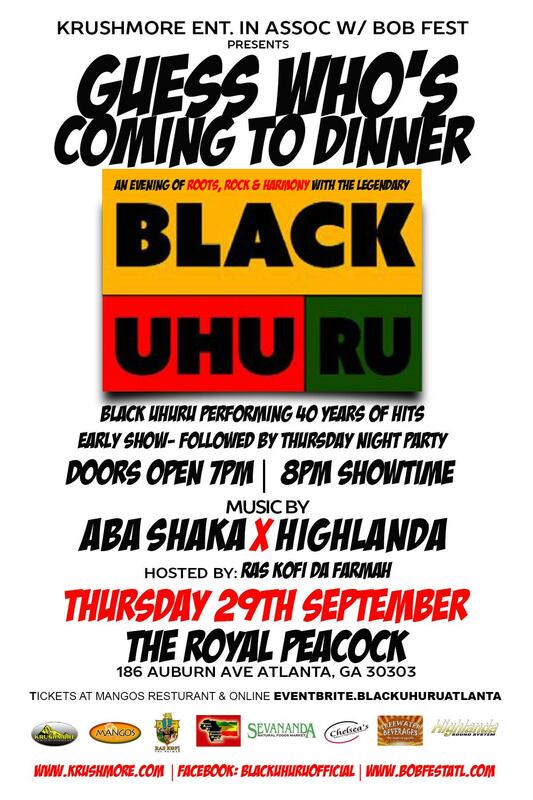 ABA SHAKA, HIGHLANDA SOUND – EMPRESS ZAUDITU – DJ REBELLION – MAJESTIC SOUNDS and a surprise guest selector. The dance will take place at The Core – 9857 Main St., East Point, GA (across from East Point Marta Station) from 9 pm until 4 am. The session will be hosted by the lovely sisters of Sol Rizing Band. Classics from Bob Marley and other classic roots selections will be showcased all night by Aba Shaka, Empress Zawditu, DJ Rebellion, and Majestic Sounds alongside Highlanda Sound featuring me Kahlil Wonda. A surprise guest selector will also be announced. There will be vendors, food, drink, and refreshing services available. Call 404-590-8010 for more information. Friday, February 10 there will be a Maroon family meeting on the full moon for a screening of the groundbreaking film Sankofa by Haile Gerima. This takes place at the Auburn Research Library, located at 101 Auburn Ave. NE., Atlanta, GA. Call 404-613-4010 for more information. Visit BobFestATL.com for tickets, vending opportunities, and any further information. 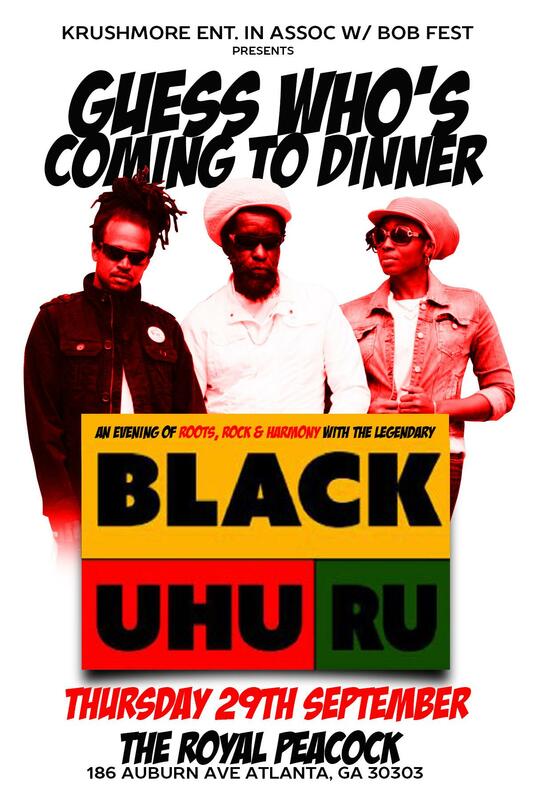 Legendary reggae band Black Uhuru will touch down in Atlanta for an early show. Thursday, September 29th – Doors open 7pm.